Sunset music Festival just announced their 2018 lineup and it is stacked to say the least. There are DJ’s from every style and genre of EDM music to appease all tastes. The festival is set to take place at Raymond James Stadium in Tampa, Florida during Memorial Day Weekend May 26th and 27th. Excision and Marshmello will headline 2018 SMF. 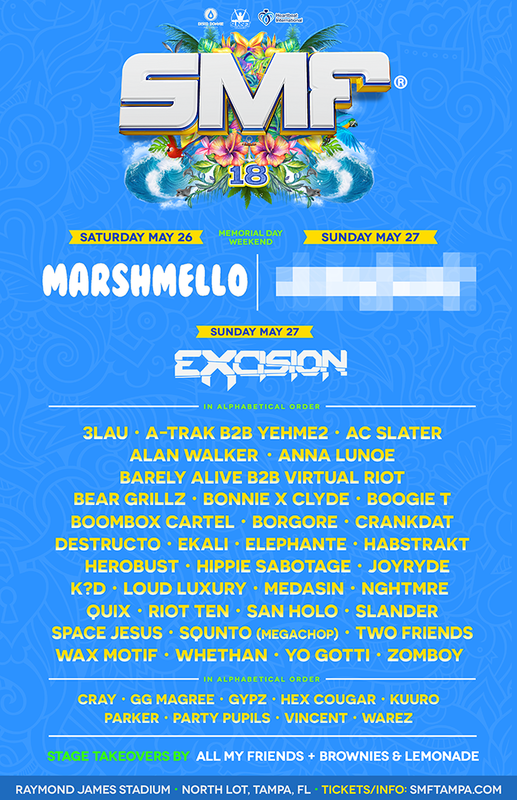 Some other artists on the lineup include: A-Trak, Zomboy, Borgore, NGHTMRE, Alan Walker, Boombox Cartel, Hippie Sabotage, San Holo, 3LAU, Slander, Bear Grillz and Herobust. Other performers include: AC Slater, Anna Lunoe, Barely Alive, Bonnie x Clyde, Boogie T, Crankdat, Destructo, Ekali, Elephante, Habstrakt, Joyryde, K?D, Loud Luxury, Medasin, Quix, Space Jesus, SQUNTO, Two Friends, Virtual Riot, Yo Gotti, Wax Motif, Whethan, YehMe2, Cray, GG Magree, GypZ, Hex Cougar, Kuuro, Party Pupils, Parker, Riot Ten, Vincent and Warez.